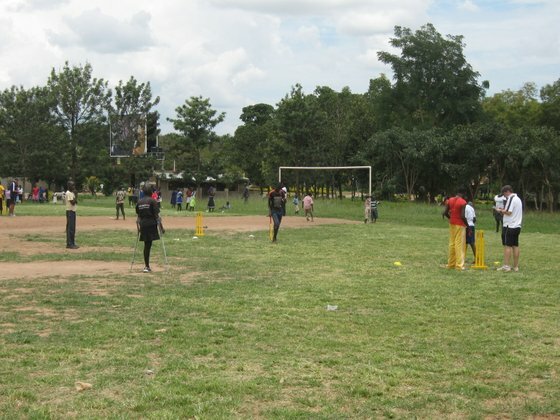 Amidst the chaos, energy and general carnage of newly-born cricket fans whipping themselves into a frenzy on municipal playing fields, it’s well worth us reminding ourselves of the primary reason we’re here in Uganda. The cloud of AIDS and HIV hangs over sub-Saharan Africa more than any region on the planet with 22 million people, more than double the population of London, living with HIV. In Uganda itself, a heartbreaking 1.2 million Ugandans of a population of 30 million are reckoned to be living with AIDS and just 45% of those infected are receiving treatment. Of course, as you travel about the towns, meeting people as you go, there are no obvious signs of this most brutal and invisible killer disease. There are no bodies at the side of the road, no disfigured faces. No obvious indication that Uganda is in the grip of an epidemic unlike any seen since the Middle Ages. AIDS simply isn’t that kind of disease, which is perhaps what makes it such a difficult enemy to battle. As is clear from our coaching sessions, however, it is clear the battle is being fought – and hopefully won – in the only place it can be: the classroom. Everywhere we go, every schoolkid has a clear understanding of their ABCs: Abstain, Be Faithful and Use Condoms. It’s a mantra that is drilled into them from almost as soon as they are able to register thoughts and we unashamedly continue to drill them home amidst the pull shots, leg-spin and one-handed catches. Every day, more and more imaginative ways of applying the ABCs to cricket are fathomed and used. From comparing our cricket bats to condoms – our protection – to ensuring we’re not caught out by AIDS by abstaining from hitting the ball in the air, to using the taking of the guard as a parallel to ensuring you are tested for the disease, the messages have become second nature. That the children are taking these messages on board is not really in doubt. But AIDS only needs one chance, one momentary lapse of judgment, to wreak havoc and destroy lives. Perhaps just as important is the tangible way that we are breaking barriers through cricket, as shown during today’s Festival Day in Arua. One of the themes of the day was the way teams mingled and worked together, including visually impaired and disabled children, working as a team and overcoming stigma. When you watch a girl with one leg send her new team mates into raptures as she thrashes the winning runs in a tournament game, shattering any prejudices that might have existed only minutes before, you realise that sport can bring people together in ways nothing else can. chris t on Day 13 – Entebbe. The final chapter. Veronika Reeves on Day 13 – Entebbe. The final chapter. Patrick Leslie on Day 13 – Entebbe. The final chapter. Hannah on Day 13 – Entebbe. The final chapter. Chris L on Day 13 – Entebbe. The final chapter. © 2010 CWB – Uganda Autumn 2012. All Rights Reserved.